With summer just around the corner, our regional teams are gearing up for an influx of avid paintball fans at our UK paintball centres. With blue skies, longer days and sunshine, it’s a great time of year to gather your comrades and play paintball. A full day of paintball adventure is a great way to keep your kids out of mischief and entertained over the summer holidays. Kids paintball parties are a fantastic way to encourage children to expend excess energy in the great outdoors whilst spending quality time with their friends and family members. Our kids paintball parties are suitable for youngsters aged 10-17 years and take place throughout the year across 35 UK paintball centres. Our full day kids paintball days out run from 9:15 until approximately 4pm and a day out with us allows participants to experience real life action and adventure taken straight from popular movies and computer games. Our themed mission scenarios will have kids bonding together to plan their attack on the two-storey castle in Castle Wallenberg, or coordinate an ambush in the Wild West themed village in our Gold Rush scenario to secure the prized gold bullion. One main concern for parents arranging paintballing days out for kids is safety. Delta Force Paintball is the industry leader when it comes to paintball experiences and our safety practices, procedures and equipment are our paramount concern. We hold a five star rating with the UKPBA (The UK’s governing body for Paintball in the UK) for health and safety practices and customer service which means we enforce the strictest safety standards ensuring your day out with us is as enjoyable as possible. Kids paintball packages start from £14.99(1) per person for a full day and includes the latest paintball safety gear, semi-automatic paintball gun and 100 paintballs per child as well as training and supervision by marshalling staff. 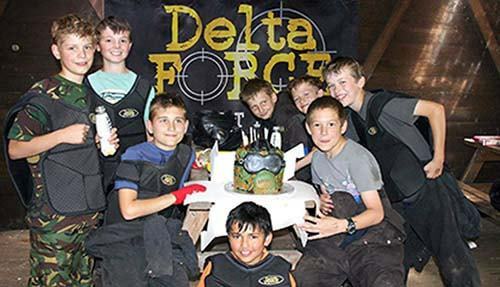 For more information about our kids paintball events at Delta Force Paintball, please call us 24/7 on 0203 869 9301 or alternatively you can request a call back from a member of staff.